The “war on terror” has provided a blanket for states around the globe to commit and collude in human rights abuses, particularly of vulnerable minorities. Aisha Maniar reports on the extraordinary case of Rasul Kudaev. Rasul Kudaev, a 35-year old Russian national, is a witness to and victim of some of the worst excesses of the “war on terror” that have been meted in out in both the east and the west. In 2001, he left Russia to go and study the Islamic religion abroad; travelling overland to Pakistan, he was arrested and imprisoned by the Taleban in Afghanistan who accused him of being a Russian spy. The Northern Alliance later handed him over to the US, who held him at Kandahar. He was then imprisoned at Guantánamo Bay in February 2002. The US accused him of fighting for the Taleban but he was quickly found to have no “valuable or tactically exploitable” information of use to the US military, and was cleared for release by the end of that year. Discrepancies in US “intelligence” about Kudaev and a pending application later filed against Russia for torture at the European Court of Human Rights (ECtHR) demonstrate the lack of intelligence involved in US military information gathering. This did not prevent his later inclusion in a list of former prisoners accused of “recidivism”. Rasul Kudaev arrived in Russia on 1st March 2004 with seven other Russian prisoners. Detained on return, they were charged and then released from prison in June for lack of evidence. The released men reported being tortured and abused in Afghanistan and Guantánamo Bay but harassment and threats were also used by the Russian authorities. Kudaev was refused a passport or identity documents until October 2005, preventing him from accessing public medical care and treatment for wounds. He returned home in poor health, suffering from many illnesses. On 13 October 2005, things became worse when a large group of armed men attacked Russian military installations in the city of Nalchik, the regional capital of the Kabardino-Balkaria Republic (KBR) in southern Russia. One hundred and fifty people were reported to have died in the attack. Living just outside Nalchik, on 23 October, Kudaev was arrested at home as part of a wave of arrests related to the attack. Beaten and bruised in detention, he was forced to sign a testimony he had not given. Brought before the Nalchik Court on 25 October, he was charged with various terrorism-related offences and murder. He has been held ever since at a pre-trial detention centre. Upon arrival there, he and the other 58 defendants were beaten. By early November, pictures of the abuse he and other prisoners had suffered at the hands of prison guards circulated. 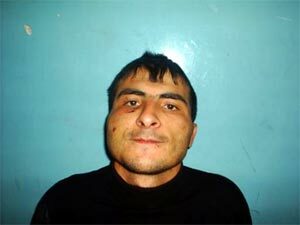 Kudaev’s face was shown to be swollen and bruised; he was beaten so badly that human rights investigators fear he has suffered permanent facial disfigurement. In spite of the arrest of 59 men in 2005, the trial only started in 2009. The prosecution gave its evidence first with some of its witnesses unable to place the defendants at the scene, even though they were able to corroborate the incident and the time. Throughout the trial, the defendants have been made to attend the court and sit in three cages as the case is heard. Rasul Kudaev, unable to walk independently due to his wounds, maintains that he was at home on the date of the incident. His mother has corroborated that. On 25 March 2013, witnesses were called to testify that he had been at home. Human rights activists, lawyers and journalists who befriended Kudaev on his return to Russia in 2004 had called him throughout the day on 13 October 2005 to be able to vouch for his presence there and updates on the situation. Kudaev was due to give his own evidence, his only opportunity to be heard publicly throughout the case, at the end of March. Shortly before that, however, he and 29 other co-defendants were permanently excluded from the court. One co-defendant, already in a poor state of health but refused medical assistance, went on hunger strike to draw attention to his plight. Ignored and forced to attend court, on 20 March, he slashed his stomach in desperation. An adjournment was refused; in response, the other defendants banged on the cages and made noises in protest and solidarity. The judges then decided that 30 defendants would be banned from attending the trial until the judgment is handed down. This move is a blow to the right to a fair trial and is also likely to be additional discrimination against the defendants in view of this being a terrorism-related trial. More pressure was added at the end of April when the 58 defendants had a civil claim for compensation filed against them for 22 million roubles, for damages suffered by those injured or killed in the attack and damage to property. Their lawyers have not yet had an opportunity to respond to the 200+ pages of claims appended to the case. The ongoing trial is now in its final stages with a ruling and sentences likely in the summer. Lawyers for the defendants believe all the men will be found guilty, the remaining issue then being the length of their sentences. As well as the extraordinary length of this case, the longest in modern Russian history, the number of defendants – 59 in total, including one who died in detention in 2008 – is quite unprecedented. This show trial simply highlights the worst aspects of the Russian legal system. With one of the highest prisoner populations in the world, abuse and torture are not uncommon in Russian jails. Last year, the UN Committee Against Torture strongly condemned Russia over the torture and abuse of prisoners, the failure to investigate and prosecute such claims, resulting in the death of two prisoners in 2012, among other failings. Where prisoners are accused of involvement in terrorism-related offences, treatment can be particularly harsh. Accused of spying for the US and Britain during interrogations, Rasul Kudaev was told more than once that prison officials could do whatever they wanted to him as he had been held in Guantánamo Bay. The “war on terror” has provided a blanket for states to commit and collude in human rights abuses, particularly of vulnerable minorities. It has also provided blanket immunity for torturers and state officials involved in such abuses across borders. With the focus on US responsibility for Guantánamo Bay, the ordeal faced at home by some prisoners on release is easily overlooked. For Rasul Kudaev, the impact has been a decade of detention without due process by both the US and Russia, coupled with the agony of untreated or poorly treated physical pain and the uncertainty of when his ordeal will end or what the outcome will be for him. Aisha Maniar is a human rights activist who works with the London Guantánamo Campaign. Follow her on Twitter @AishaManiar.